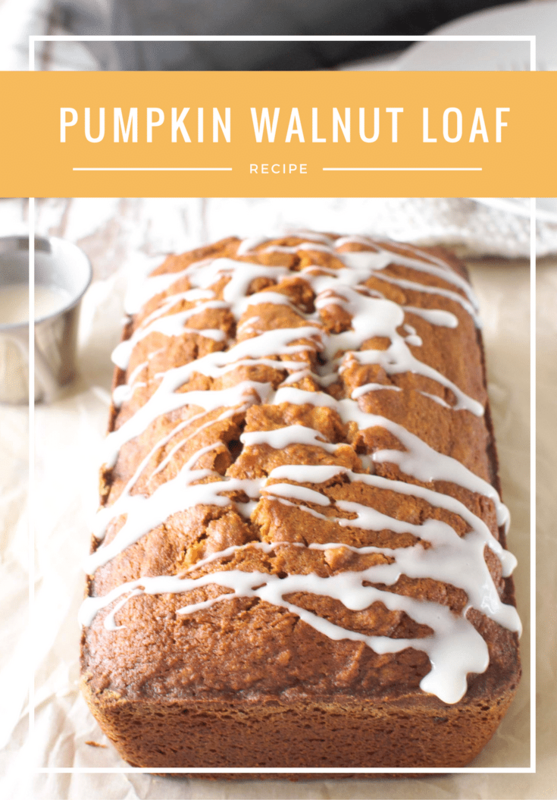 This Pumpkin Walnut Loaf is incredibly moist, scrumptious and so easy to make. Baking it will fill your home with the comforting aromas of fall spices. Yesterday was my one year blog anniversary, so to celebrate I made my favourite Pumpkin Walnut Loaf. I’ve made this recipe several times and it always comes out delicious. So today I’m sharing it with you. 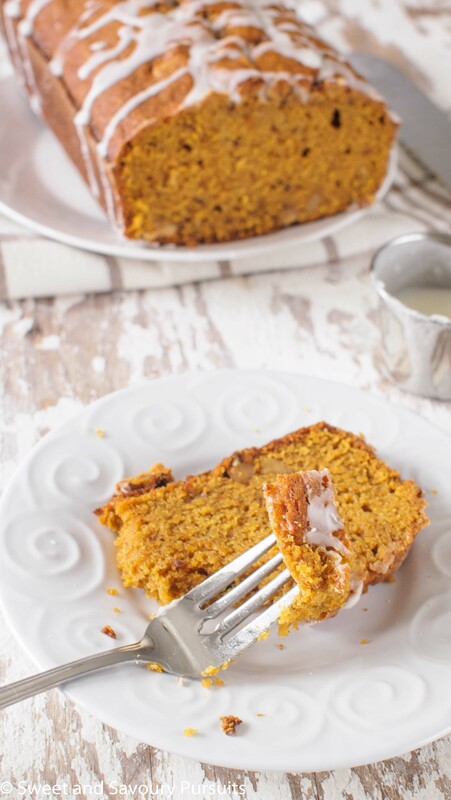 This Pumpkin Walnut Loaf is incredibly moist, scrumptious and so easy to make. Best of all, baking it will fill your home with the comforting aromas of fall spices. I adapted this bread recipe from Bon Appétit. I wanted to include some whole wheat flour in the recipe, some brown sugar (because it tastes so good and goes so well with fall flavours) and some ground ginger which I found the original recipe lacked. 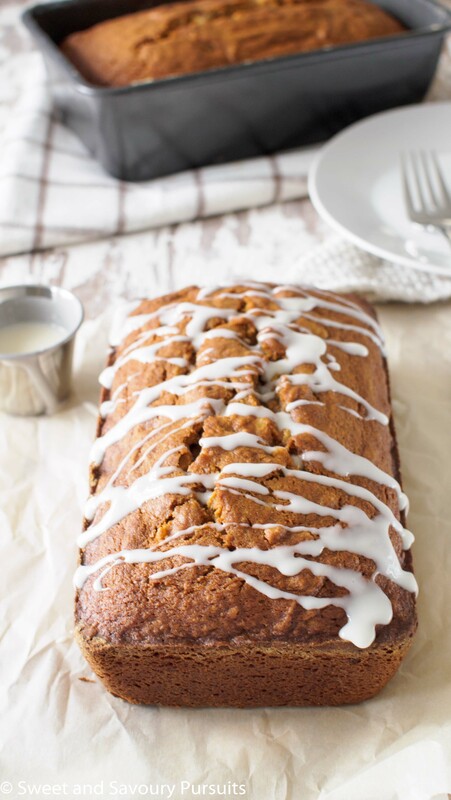 I added a basic recipe for a glaze to drizzle over the loaf which will definitely transform the recipe into a dessert, but this loaf is delicious and sweet enough even without it. This recipes makes two loaves, so you can enjoy one and give one away. But if you decide it’s so good that you can’t part with it, you can wrap it well and freeze it for later use. Position a rack in the center of the oven and pre-heat the oven to 350°F. Grease and flour two 9x5x3- inch loaf pans. In a medium bowl, whisk together the flours, cinnamon, ginger, cloves, nutmeg, baking soda, baking powder, and salt. Set aside. In another bowl, beat the sugars and oil until well combined. Add the eggs, one at a time, whisking after each egg so it’s well mixed in. Add the dry ingredients into the pumpkin purée in two additions and stir just until evenly incorporated. If desired, add the toasted walnut pieces and stir to incorporate. Divide the batter evenly between the two loaf pans and spread the tops with a rubber spatula. Bake until the loafs are golden brown and a toothpick inserted into the loaves comes out clean, about 60 to 70 minutes. Cool in the pans on a rack for 10 minutes and then turn the loaves out unto the wire rack to cool. In a small bowl combine the icing sugar with the milk and vanilla extract. Stir well. If necessary add more milk to reach desired consistency. Drizzle the glaze over the loaf and serve. I bought a can of pumpkin purée to make your pumpkin scones (they were delicious!). I made two batches of scones with enough purée left over to make this pumpkin walnut loaf recipie. Omg so delicious and was super easy to make. I will definitely be making this again. Thanks for the great recipes. Thank you so much Sadia, that’s so kind of you to say! Happy blogiversary 🙂 This cake looks like a lovely way to celebrate! 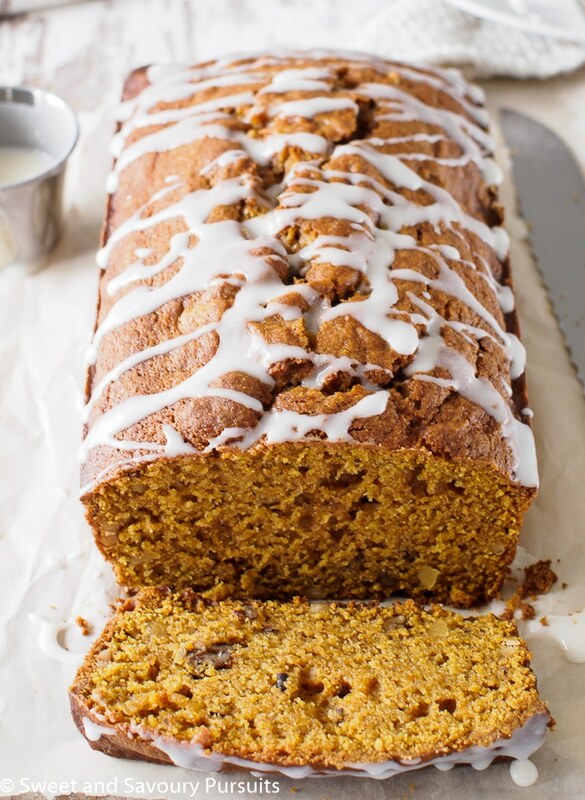 This pumpkin and walnut loaf looks delicious, perfect for this time of year too!